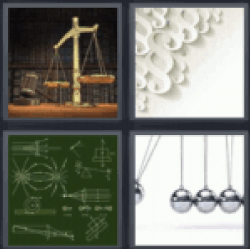 4 Pics 1 Word Scale and gavel. White 8-like designs. Green chalkboard. Silver balls. Thanks for visiting 4-Pics-1-Word.com, here are the cheats for your favorite game. 4 pics 1 word scale. Find the 4 pics 1 word answers you need and still have fun with the game that has hooked millions of people. 4 pics 1 word scale.